I am intrigued by the upcoming zombie downloadable content for Red Dead Redemption. On the one hand, zombies are so 2008. I'm done with them. 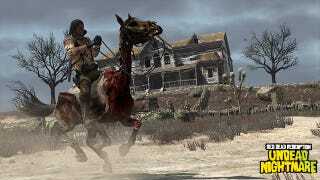 On the other...that's John Marston riding a zombie horse. Plus, it's nice seeing some serious single-player added to the game, rather than more multiplayer, seeing as the appeal of Red Dead for most is the single-player, and not that other game mode, where random strangers like to gang up and shoot the poor guy who's stuck riding into town on a donkey.